Extracting herbs in alcohol is a quick and simple way to preserve their benefits for later use, so it’s no wonder that the little brown bottles of extract have become ubiquitous. Pre-made extracts are available for sale in almost every herb shop, and it’s easy to mix up a batch at home using vodka or brandy. But alcohol can be a substance that some want or need to avoid. At first, it may seem like you are out of luck if that’s the case, but don’t worry. Whether you want to avoid alcohol because of health or religious reasons, or due to pregnancy or a medical condition, there are still plenty of ways to use herbs that don’t include alcohol. Probably the most common options for using herbs without alcohol are herbal teas, and the capsules or gelcaps available from some herbal companies. But really, going alcohol free still gives you many, many more options than that. In fact, going sans-alcohol means that you can turn to the creative side of herbal tea blends, delicious herbal honeys and glycerites, vinegar-based oxymels, and infused oils for a vibrant home apothecary that showcases the variety and beauty of herbs, their many health benefits, and their flavors in a way that you totally miss if you only use an alcohol based tinctures. Vinegar can be substituted for alcohol when making an extract, and has always been a popular folk alternative to the more mainstream choice of alcohol. Any fruit based vinegar can be used, with apple cider vinegar perhaps being the most popular and easily available. Vinegar extracts usually have a shelf life of six months to a year, so plan to make them more frequently than an alcohol based tincture. Infused herbal vinegars, which focus on herbs for their flavor as well as their health uses, can be used as the base for vinaigrettes on a salad, a condiment when cooking, or even as the base of a “shrub”- a type of drink made with fruit juice and vinegar in water. And don’t forget the old herbalists standby for cold and flu season – no herbal medicine chest (alcohol free or otherwise) would be complete without fire cider! Learn how to make herbal vinegars here. A glycerite is an herbal extract made with a base of vegetable glycerin rather than alcohol. Glycerin has a sweet taste but has no carbohydrates or sugars- it’s actually extracted from fats and oils – and so doesn’t impact blood sugar levels. Glycerites are very shelf stable, and can last as long as two years. If your glycerite recipe uses fresh herbs, 100% glycerin can be used, but when using glycerite with dried material you should add around 30% water to help rehydrate the herbs. Glycerin has an affinity for extracting herbs like white oak or raspberry leaf that contain high levels of tannins, but it can be used for most herbs. If you’d like to try your hand at making a glycerite, you can read more about them and find directions in our article How to Make Herbal Glycerites. Herbal syrups are simple to make with an infusion or decoction and some honey, maple syrup, molasses, or other sweetener. Whether it’s a blend of herbs for a specific health challenge, or as a way to make a single herb more palatable a syrup is a good basic recipe to know. Without alcohol as a preservative, it’s best to keep herbal syrups in the fridge where they will usually keep for a year or two – if they last that long! A 1:1 ratio of sweetener will also help give your syrup a longer shelf life. Try this Dandelion Flower Syrup recipe to get started! An oxymel is an herbal vinegar extract that has been mixed with honey to sweeten. They are especially nice as a beverage if mixed into a glass of water, or they can be enjoyed right off the spoon. They have an unusual sweet and sour taste that can be a nice change of pace, and allow you to access the benefits of herbs extracted with vinegar while tempering the sour vinegar taste. By adding fruity-flavored herbs like elderberry or hibiscus to the vinegar you can often make the oxymel even better tasting. There are many herbal teas on the market. You can buy single herbs pre-made into tea bags, buy single herbs in bulk, or purchase herbal tea blends. But the sky is the limit when you learn how to mix your own herbal teas, and your homemade blends can become a feast for all the senses. By taking a tea or tea blend and adding sparkling water, fruit, spices, or other flavorings, you can create delicious herbal drinks that are as unique as they are healthy. And our list could go on and on! Herbal jellos and gelatin gummies, herbal honeys, smoothies made with herbal teas instead of water or with herb powders as one of the ingredients, herbal lozenges and lollipops. . . Ditching the alcohol doubtless gives you more opportunities, not less. With so many delicious, easy alternatives, your taste buds will be delighted that you made the switch, and you’ll find yourself pushing aside the little brown bottles to find the good stuff. 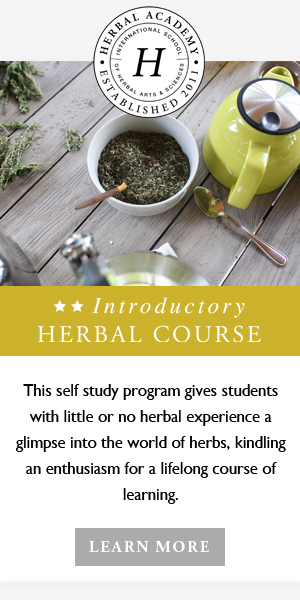 If the idea of learning to create vibrant herbal recipes inspires you and you are interested in learning more, be sure to take a look at our online herbal programs. The courses are full of hands-on recipes for students to make and share on the community forums as they complete the courses. It’s a great place to get inspiration, and your instructors are always just a message away to help you with questions and encourage you along the way. We’d love to see you in class!